• COPYRIGHT SIMPLIFICATION AND SOFTENING: by special permissions and methods, quotations of any size may be used by anyone and mixed together frictionlessly. • ORIGIN CONNECTION: All quotations and excerpts stay connected to their original. • TWO-WAY LINKS: anyone may publish connected comments to any page. • DEEP VERSION MANAGEMENT: documents may be changed incrementally (with each version available); versions may branch; authors may easily see exact differences between versions. • INCREMENTAL PUBLISHING: new changes may be continually made by authors without breaking links. How can this be? Very simple, but very different. The Xanadu model has always been very simple: make content available with certain permissions; then distribute and maintain documents simply as lists of these contents, to be filled in by the browser (in the same way that browsers now fill in GIFs). This list of contents is effectively a virtual file of contents to be sent for and how to put them together. • everyone can re-use all content virtually, simply by listing the desired content. • Since links are between the addresses of these contents, links are intrinsically bidirectional, may be made by everyone, and may overlap in vast numbers. • Since the original address of content is known, its original context may be obtained. We will not go into further details here. These matters are written up at length in various places, e.g. the recent Xanadu technical summary for the ACM. The Xanadu copyright model-- now called "transcopyright"-- takes a little more explaining. 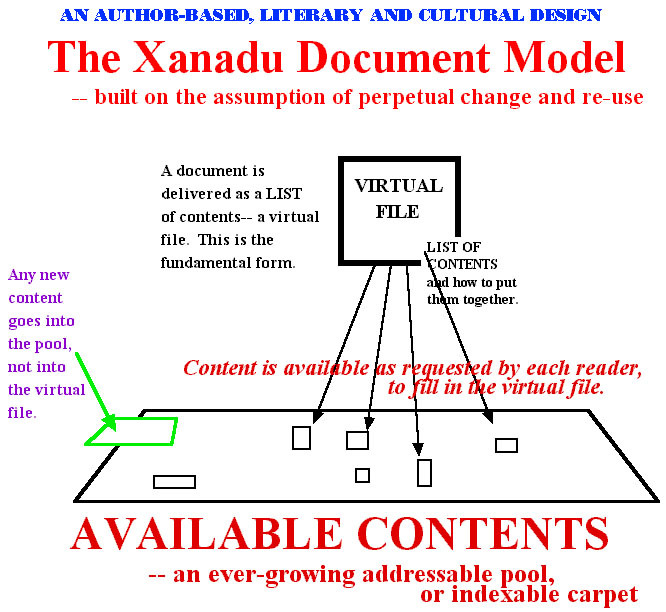 We are now moving the Xanadu model to the Web, which is an uphill fight, but we believe it's worth it. The political fight against the weight of today's standards and methods is enormous. But what we are trying to do is clear up the problems that these standards, and the present way of thinking, have created.